It’s been said that if Shakespeare were alive today, his bread and butter would be writing for soap operas. Sure, he’d probably still conjure up a Hamlet or Macbeth. But his day job? Probably similar to that of Agnes Nixon, the creator of All My Children and One Life To Live, two longtime daytime television series that last week received the axe from ABC Daytime, their longtime home . The genre has existed since the days of radio broadcasting. The term “soap opera” derives from when the radio series were sponsored by detergent makers. Soap operas seamlessly crossed mediums when television replaced the radio in dominance. When appreciating the arts and literature, one can like what one likes, but must also leave at least a special appreciation for certain forms that might be outside of the normative realm. Forum and Boeotia aspire to recognize and comment on the arts and literature in their myriad forms, and it is the opinion of this Assistant Blog Editor that daytime television series are worthy of as much literary analysis (and respect) as the classics produced by Austin and Bronte. ABC Daytime will now only have one soap opera on the air. General Hospital is the highest-rated soap opera out of the three that lived this long into the 21st century and, quite frankly, I don’t have the slightest idea why. Out of the three series, GH was my favorite, but the writing quality declined significantly beginning sometime around the turn of the century. Felicia Scorpio is not a deadbeat mother. Laura Spencer is not a helpless invalid. Her son Lucky is not a philanderer. The mob has no business being in control of the entire city — the show is called General Hospital! But that’s just me being a fan. I will miss my stories, particularly One Life To Live, which in recent years had made a quiet resurgence — “quiet” because it was overshadowed by the attention the network heaped on GH. Not only does OLTL have the most solid writing out of the three ABC Daytime soaps, the production values are much more impressive than what one might expect from a meager soap opera. Cinematography, scoring, direction: you name it, that series churned it out every week day. As a literature fan, I am mourning in the same manner as I am for the constantly looming death of print media. But newspapers, magazines, and even book stores are on track to cheat death. All My Children will end this September, One Life to Live by January. An art form has truly come to an end. It’s not often that an art exhibit representing a country goes to the extent of actually showcasing remains of its own citizens. No, nobody’s limbs were severed and put on a podium, but Teresa Margolles’ vibrant yet grotesque 2003 piece, Papeles, brings you bodily fluids in a surprisingly beautiful arrangement. The piece takes up a whole wall and displays large rectangular sheets containing streaked patterns of brown and yellow hues that, juxtaposed together, bring to mind the splendor of a moth’s wings. But the beauty is met with an equal amount of repulsion: Margolles used the post- autopsy water from the victims of narcoviolencia—or those individuals that experienced the fatal repercussions of drug trafficking. The water came right from the Mexico City morgue. 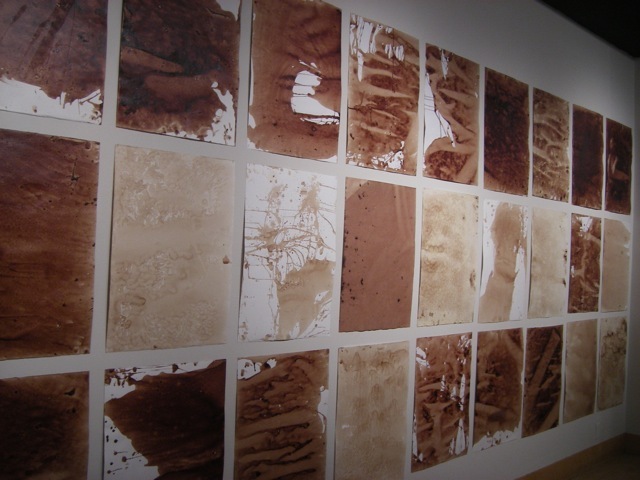 Each paper represents an individual portrait of a person and their remaining traces of life. You can’t help but feel a bit tricked — your first feeling is sheer warmth from the luminosity and size of the work, but as you step in closer to read the details, you immediately get a lump in your throat and feel the need to back away slowly, frantically searching for mutual glances of horror from the other onlookers. Margolles’ bold statement effectively demands a reaction to an ongoing issue that has caused so many deaths and so much strife in Mexico. She also gives an odd vibrance to each portrait as she has, in fact, captured their final essence, and in the most direct way possible, Margolles brings a part of Mexico to you. 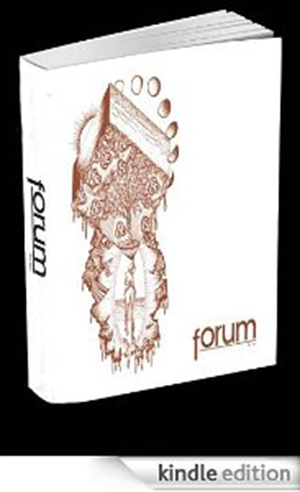 Do you like the type of work that Forum is doing? Would you like to pursue your literary reading or writing beyond the hallowed gates of the college community? Then may I suggest that you check out the Council of Literary Magazines and Presses (CLMP). The CLMP, which has been around in some form or other since the late 1960’s, and has been online in its current form since 2000, was meant as an intersection of independents in the publishing industry, at the CLMP website, located at www.clmp.org , you can find a directory of near a thousand independent literary presses and literary magazines from all over. From the Haight Ashbury Literary Journal located here in San Francisco, to the Hollyridge Press (http://www.hollyridgepress.com/) in Venice California, the Boston Review (http://bostonreview.net/) which is published out of Massachusetts or even as far as 96inc which at the very least is written in Japanese – just to name a few. Of course just because it has a large number of diverse magazines and presses in its registry does not mean that there aren’t any that CLMP skipped over; Paris based 3:AM Magazine (http://www.3ammagazine.com/3am/) with its slogan of “Whatever it is, we’re against it” provides fiction, poetry, interviews, critical writing, and non-fiction to its readers, online only, social justice focused, identity theory (http://www.identitytheory.com/), or apparently the oldest surviving online literary magazine ECLECTICA Magazine (http://www.eclectica.org/) are all seemingly missing from the CLMP database. So if you are a writer or a reader and you want to do more of either keep your eyes open, because there are plenty of opportunities out there to expand your literary world.